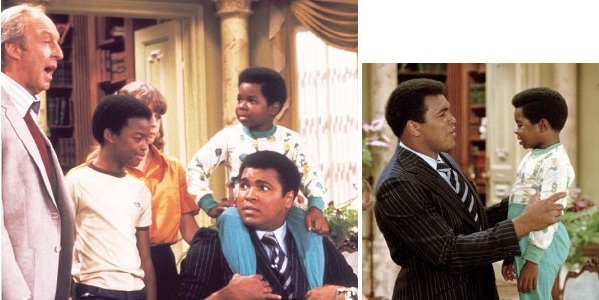 The Television Crossover Universe: The Greatest: Floating like a Butterfly, Stinging like a Bee! I was never really into boxing. But when I was a kid, there was one iconic figure who stood out in boxing, even after he was no longer the heavyweight champion. And that was MUHAMMAD ALI. 1860s--Abe Grady immigrates to the Unites States from Ireland. He was the great grandfather of Cassius Clay. 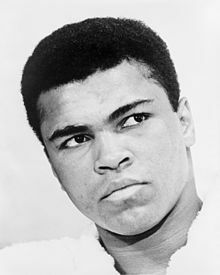 1912--Birth of Cassius Marcellus Clay, Sr., father of Cassius Clay. 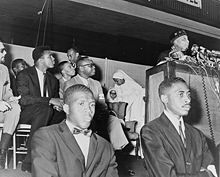 1917--Birth of Odessa O'Grady Clay, mother of Cassius Clay. January 17, 1942--Birth of Cassius Clay. 1954--Cassius Clay begins training as a boxer. 1955--The death of Emmett Till leads Cassius Clay to vandalize a local railyard. 1958--Cassius Clay graduates from high school. Summer 1960--Cassius Clay wins a gold medal in the Olympics. October 29, 1960--Cassius Clay makes his professional debut. 1964--DC: THE NEW FRONTIER--Ted Grant defends his heavyweight title against a young Cassius Clay. In the comic, this is set eight years earlier in 1956. Of course in the real world, it was not Ted Grant who he took the title from. DC: The New Frontier features a world where the golden age heroes existed in the same world as the silver age heroes, but they debuted in their original time periods without using "comic book time" sliding timeline. 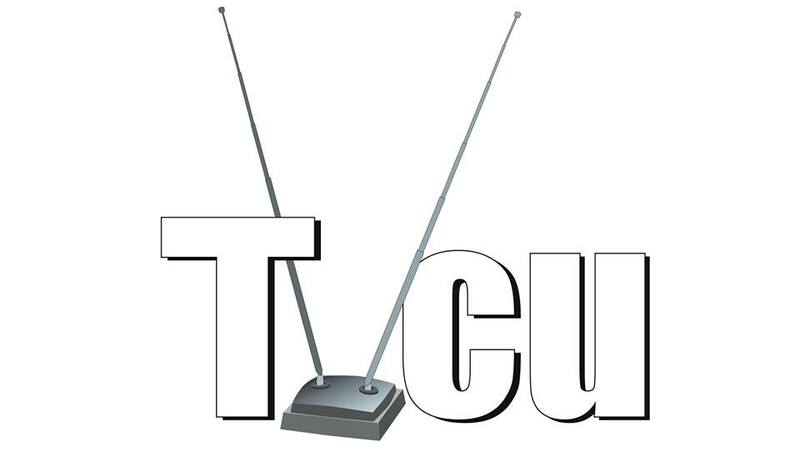 That works for the TVCU. 1964 to ?--FOES OF ALI--Ali has appeared in numerous video boxing games, some of which feature him as the title character. Examples include Foes of Ali, Muhammad Ali Heavyweight Boxing and the Knockout Kings series and its follow-up, the Fight Night series. 1964--Cassius Clay marries Sonji Roi. 1964--Cassius Clay becomes Muhammad Ali. 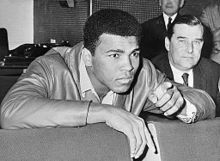 1964--MUHAMMAD ALI'S GREATEST FIGHT--World champion boxer Muhammad Ali requested exemption from the military draft based on his religious beliefs. His request was denied and when he refused induction into the army, he was convicted and sentenced to 5 years imprisonment. His case eventually works itself up the Supreme Court. In their first conference after the case is presented, the justices decide by majority vote to uphold the conviction and Justice John Harlan is tasked with preparing the majority opinion. He assigns one of his clerks, Kevin Connolly, to prepare a first draft but try as he might he believes that decision his wrong. His draft argues for overturning the conviction and Harlan agrees with him. The justice must now find a way to convince his colleagues. 1966--Muhammad Ali divorces Sonji Roi. 1967--Muhammad Ali marries Belinda Boyd. 1968--Birth of Maryum "May May", daughter of Muhammad Ali and Belinda Boyd. 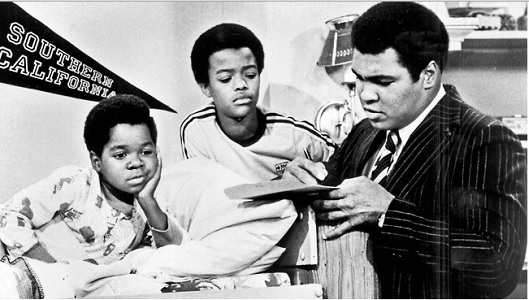 1970--Births of twins Jamillah and Rasheda, daughters of Muhammad Ali and Belinda Boyd. 1971--After a four year legal battle for refusing to go to Vietnam, Muhammad Ali is released from prison and has his championship status reinstated. 1972--Birth of Muhammad Ali Jr., son of Muhammad Ali and Belinda Boyd. 1974--Muhammad Ali wins the heavyweight title back. 1974--Birth of Khaliah, daughter of Muhammad Ali and Wanda Bolton. 1975--Muhammad Ali publishes his autobiography. June 1, 1976--Muhammad Ali takes on professional wrestler Gorilla Monsoon. 1977--Muhammad Ali divorces Belinda Boyd. Early 1977--Birth of Hana, daughter of Muhammad Ali and Veronica Porche. 1977--Muhammad Ali marries Veronica Porche Ali. 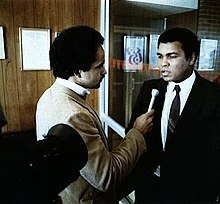 Fall 1977--I AM THE GREATEST: THE ADVENTURES OF MUHAMMAD ALI--Animated series in which Muhammad Ali provides the voice for his animated counterpart. 1978--Muhammad Ali wins the heavyweight title a third time! January 1979--VEGAS--"The Eleventh Event"--A benefit telethon is planned for Leon Hazlett, a five-time Olympic gold medalist who was crippled in a car crash. But emcee Paul Baker is kidnapped and a $200,000 ransom is demanded. -- IMDb Plot: "The Eleventh Event". Also from DVDTalk: Tanna's good friend, Olympic Medalist Leon Hazlett, returns home after losing the use of his legs in an accident. He quickly finds himself involved in an elaborate kidnapping for ransom scheme that involves a singer, his wife and his manager. Robert Loggia, Clifton Davis, Jill Haworth, Michael Conrad, Squire Fridell, Vernee Watson-Johnson, and Muhammad Ali guest star. 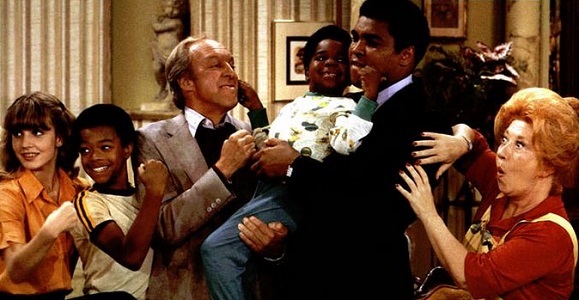 October 1979--DIFF'RENT STROKES--"Arnold's Hero"--Arnold wants to meet his hero, world champion boxer Muhammad Ali. Willis and Kimberly meet Ali and say that their little brother is dying and that his last wish is to meet him. -- IMDb Plot: "Arnold's Hero"
1981--Muhammad Ali retires from boxing. 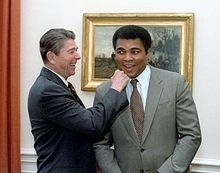 1984--Muhammad Ali is diagnosed with Parkinson's Syndrome. 1986--Muhammad Ali divorces Veronica Porche Ali. 1986--Muhammad Ali marries Yolanda Williams. 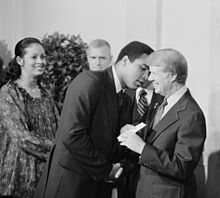 1990--Death of Cassius Marcellus Clay, Sr.
1994--Death of Odessa O'Grady Clay. 1998--Birth of Biaggio Ali, son of Rasheda and Robert Walsh. May 1999--TOUCHED BY AN ANGEL--"Fighting the Good Fight"--Muhammad Ali appears, playing himself. 1999--Laila becomes a professional boxer. 2009 to 2014--WAREHOUSE 13--Muhammad Ali's boxing gloves are in the warehouse. They cause people to see stars just by being in the presence of the gloves without ever actually being hit. Claudia uses them as a Christmas decoration to make the warehouse more festive. May 2015--CHINA, IL--"Displays of Manhood"--Frank takes on Muhammad Ali. Mr. Six, the mascot of Six Flags, is amongst the spectators. June 3, 2016--Death of Muhammad Ali. A WORLD WITHOUT SUPERMAN--Captain Kentucky fights Muhammad Ali.